A free book about you can develop the key elements of your emotional intelligence. You have probably heard of emotional intelligence, but wondered what it is all about. Emotional intelligence is the secret ingredient that separates people who seem to effortlessly succeed, from those who struggle in their careers. 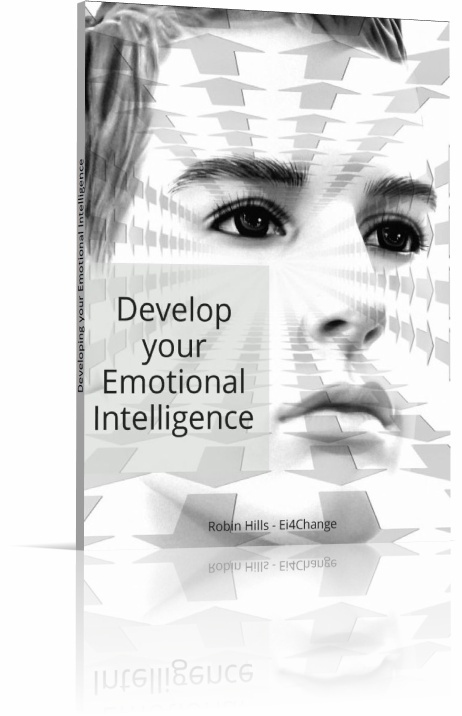 This special guide from emotional intelligence coach, trainer and facilitator, Robin Hills of Ei4Change, is your introduction to this important concept and covers how you can apply it in your life - at work and at home. It has been written for managers and leaders who are managing and leading people for the first time. However, you will find the book useful if you have never managed anyone or if you have managed and lead teams for years. There are methods that you can use straight away to increase your emotional intelligence and transform every aspect of your work, your career, and your life. Putting the easy-to-apply hints and tips into practice, will help you and those that work with you achieve their potential. You’ll be amazed at what you and your team will be able to achieve. Get access to the book "Develop your Emotional Intelligence".